Too Faced VS Milani - DUPE?! First things first - the formulas on these two are VERY different. But the color is practically spot on to each other! I fell in LOVE with the color of the Too Faced Melted Berry liquid lipstick like forever ago and I could NEVER EVER seem to find a color dupe for it. So when I finally had a giftcard I ran in and picked it up so super fast! Fast forward to now, and I was in Walmart at like 11pm on a Tuesday (judge me not) and was browsing the beauty section when I came across this Milani Amore Matte lip creme and was just instantly drawn to this color. It ran across my mind really quick that this looks A LOT like my favorite lippie, so I picked it up (it was only $9!) and decided to give it a whirl! Color-wise they are so damn similar it really is hard to tell a difference when you have them on. The Milani one has a regular straight applicator while the TooFaced applicator was a 'precision tip applicator'. It's definitely not the 'precision' tip I thought it was gonna be. I honestly prefer the milani applicator to the Too Faced one - gives me more control and it doesn't just bleed all over my lips like the Too Faced one does. They both have a tendency to be a little streaky, but you're going to need multiple coats to get the full opacity anyway. Another major difference is the staying power of these lippies. The Too Faced one is amazing, lasting like 6-7 hours on me with only one touch up after lunch. The Milani lippie lasted nearly all damn day though, and blew the Too Faced out of the park. I applied it at 10am and wore it until about 8pm, it lasted 3 meals, a few bottles of water, and really only needed to be touched up after dinner. I also swatched it on my arm and I COULD NOT get it off unless I SCRUBBED it. I had to go to town on my arm with hand sanitizer at work so I didn't look like a crazy with pink swatches on my arm. Overall - I love them both. Too Faced made me fall in love with this color and a liquid lip formula. But I think I love the Milani one a little bit more. Its lasting power and price tag are major pluses for me. Too Faced has a better color range than the Milani ones, but for the $21 price tag unless I'm in LOOVE with it, I think I'll pass. 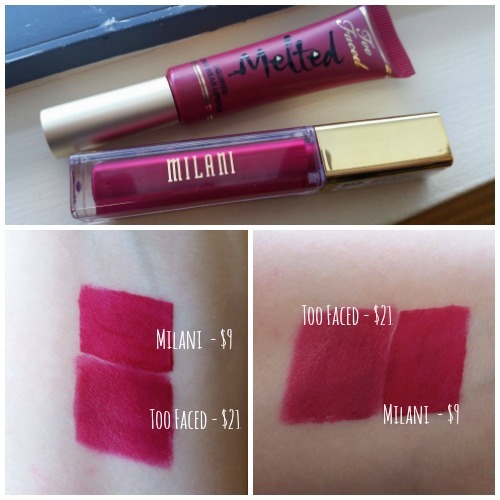 I def have to say I'm in looove with the Milani one over the Too Faced one - it def has better coverage too! That's a fantastic color. Love your beauty posts and such a great find!